Ashtanga Vinyasa Krama Yoga and Beyond...at home : Pimping up Krishnamacharya's Life saving yoga sequence plus 8mm vintage video app for iPhone. 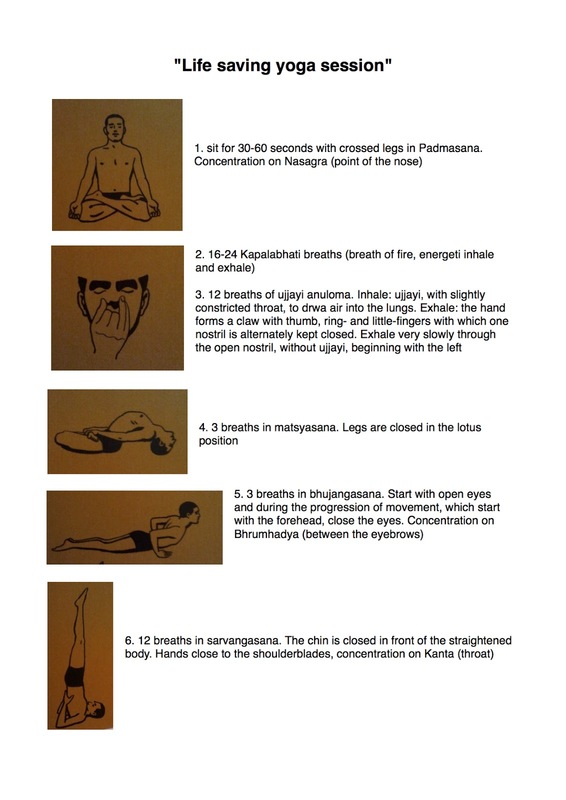 Pimping up Krishnamacharya's Life saving yoga sequence plus 8mm vintage video app for iPhone. Even added a video, mainly an excuse to play around with the filters on the Vintage 8mm video app from itunes. What I'm finding more interesting though is using it as a framework for my main morning practice. I've included a couple of ideas for how you might pimp it up at the end of this post. "Starting from the 50s more and more visitors came from the West to Krishnamacharya in Madras, to learm Yoga from him, the 'teacher of teachers'. Krishnamacharya developed for them a specific sequence that he named 'Life saving yoga session'. Yoga to extend life, the name did not fail to work. Krishnamacharya's idea was to use this sequence to lead Westerners to an unconfessional and undogmatic experience of the Divine, since their pluralistic culture would not permit an automatic access to religious matters. *Thank you again to Chiara fro the translation from the German. Here are some print out practice sheets. 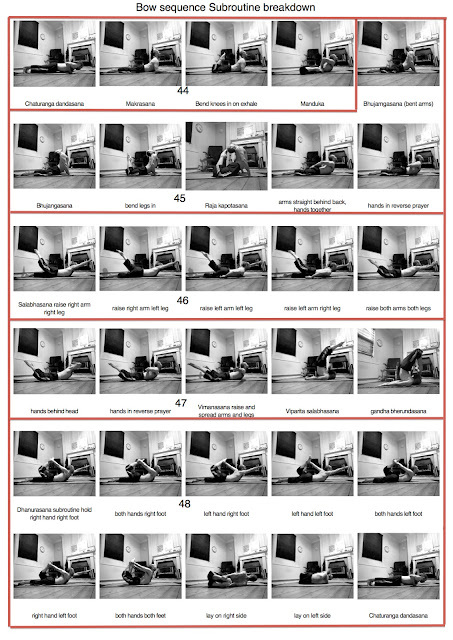 Start off the same with 1. and 2., the breathing preparation, perhaps just seated with the legs crossed if you find moving directly to lotus a little tough ( the movies director, Jan Schmidt-Garre sits crossed legged in the film rather than in half or full lotus). I then come back up to standing for the basic 10 minutes Tadasana hand and arm variations that I like to use as a warm up, I do this whether I'm practicing Vinyasa Krama or Ashtanga. I tend to follow this with a couple of Sun Salutations A and B, the full ten, five of each or 2x A and 3x B or just one of each taken nice and slow, or perhaps with the surynamaskara mantra, depends how much warm up you feel you need that morning. I like to include Trikonasana A and B whatever I do because it's such an excellent twist. Next up I include the Utthita hasta padangusthasana sequence because I still hate it so figure it must be good for me one way or other. Other Asymmetric subroutines or parts of subroutines are an option here, perhaps to include some mores twists. After Bhujangasana I like to do some more backbending Bow postures followed by Ustrasana and possibly kapotasana finishing backbends with urdhva Dhanurasana and perhaps a drop back or two. And of course one could include some of the shoulderstand or headstand variations. 9. Bhujangasana again or another bow variation. But of course it's flexible, at each stage you can add more or less of a particular Vinyasa krama subroutine or two. 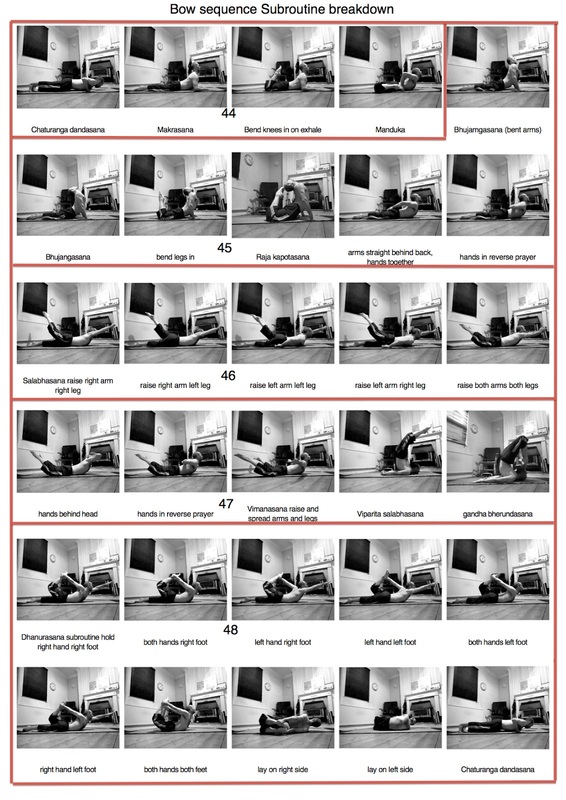 Each day could have a different focus, Bow postures one day after stage 5. another day Supine vinyasas at 6. or More Asymmetric at 9. or 10., seated subroutines at 11. Either way Krishnamacharya has included what he considers the key, essential postures of maha mudra, paschimottanasana, Shoulderstand and headstand. In the video above I included a few jump back and through variations, use as many as those as you wish or perhaps keep it very simple transitioning only between stages. recostnWow, the devil's in the detail. I like the 12-part counting, using the 3 parts of 4 fingers on the left hand. Also looking forward to trying palms outward in Halasana, after so long doing it palms in, per Ashtanga method. "recostnWow, the devil's in the detail.' Sorry didn't catch your meaning there was taht a typo or am I being slow. I hadn't noticed that he has you turn the palms out in halasana, tried it this morning and it felt comfortable, more so than in prasariata C where everytime i try it I'm struggling to keep my little fingers linked, the floor helps in halasana. "Recostn" ...... That was from the spam-checker that you need to enter to comment. The cursor went walkies when I wasn't watching! Yes, I tried turning out my palms in Halasana, and felt like I was in strangely unfamiliar territory, but I'll stick with it for a while and see if anything new opens up. The best things happen slowly. I'd noticed many of Krisnamacharya's photos feature him teaching long stretches with fingers interlaced and it seems to be very good for easing compression in the cervical spine and easing generally achy shoulders. Great for deepening the breath too. This Life saving yoga session is very similar to the Sivananda series. Thank you Enrique for taking the time to lay this out, makes Anon's comparison clearer. i had a brief flirtation with Sivananda yoga a couple of years back but at the time was too stuck in my Ashtanga ways. "Unity is from Both relaxation of continued effort and the infinite." When Working with the breath in its Āsana INITIALLY Perhaps less appealing, but ultimately more attractive, satisfactory and Effective, to integrate a focus of samapatti (Unity) of Śaithilya (Relaxation of the breath) in Ananta (the Infinite), through a developmental Sadhana (Means to Accomplish) on Dirgha or Length, supported by Suksma or Subtlety. - The common denominator for successfully uniting (samapatti) both (bhyām) aspects of relaxation (śaithilya) and the infinite (Ananta) Within the practice of asana is the Breath. I saw it as the 'continued effort' (prayatna) synonymous with 'giving life' (Jivana). The continued effort of the Breath is That Which Gives life. 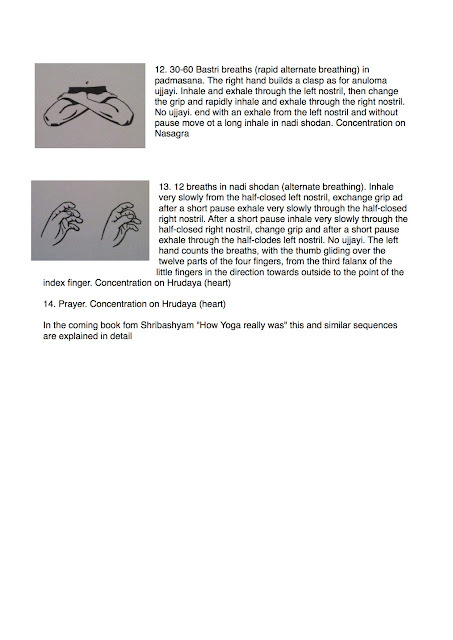 "Pranayama For this to be effective, must also have a regular practice of Mudra, such as: Karani Viparitha, Maha Mudra and Mudra Asana asana Ashvini as Baddha Ardha Paschimathâna Matsyendra Kona asana asana. Asana and Mudra is saying anything, acting on the origin of our "emotional response" which is Nabhi, Navel. " Thank you for sharing your notes anon. I seem to remember the pranayama article from Madhu's Kaivalyamaui blog, I must look at it again and how it compares with Salutations. 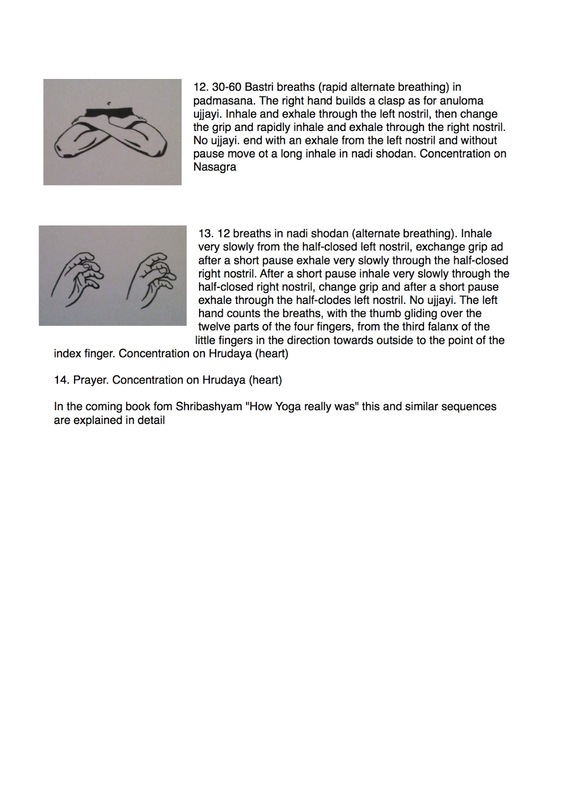 i see what you mean re the mudras having similarities with the Rishi approach idea. going to pick that up on your other comment. "The sequence that follows, centered around the warrior pose (virabhadrasana) and its variations, was a favorite of Krishnamacharya’s. Incorporating a wide, open stance, and requiring coordination and balance, this classical vinyasa can be a good addition to a generic asana practice. It can be made more or less challenging, or modified by adding a lateral bend or different arm positions. It can also serve as a core standing vinyasa from which you flow into other asanas and then return." practice watching your video yesterday Krishnamacharya was saving my life relaxing. Thank you for this link Anon. I saw the poster when AG Mohan released it but haven't tried practicing it yet. this is a good reminder. Any more information about the Shribashyam "How Yoga really was" book? I can't seem to find anything online. Thanks for the link; I sent them an e-mail. Let me know if you hear anything yourself Nick.